What became of Korach? I’m sure you recall how dramatically he was swallowed up by the earth, because of his rebellion against Moses, when we were reading Numbers 16, six weeks ago. Perhaps you would hold on to that thought and we shall return to it. The Book of Deuteronomy is essentially the words of Moses, somewhere between a speech and a memoir, including strong theological statements such as the Shema, parts of Birkhat ha Mazon, and the ‘Choose life’ text; Deuteronomy also contains blessings which are familiar to us through our liturgy, and some antithetic curses, which are not quite so familiar. In this Torah reading, Ekev, Moses speaks of the fertility of the land which the Israelites are about to enter, how it flows with milk and honey, and seasonal rainfall contributes to a plentiful harvest. God’s eyes are upon the land, Moses explains, and, when the people are faithful to God, the earth will be bountiful. If they are seduced by other gods, there will be neither rain nor harvest. These words are to be worn as a sign, by means of tefilin, between the eyes and on the hand and on mezuzot: the doorposts of your house. The part of the Shema which commands tefilin and mezuzot in Deuteronomy 6 is repeated here in Ekev. The fulfilment of all the promises regarding the land depends on the obedience and fidelity of the people. On the one hand, you have the laws, statutes and commandments, and on the other, the land. This is indeed a contract between two parties: God and Israel. Coming back to Korach, you may remember that he was from the tribe of Levi and therefore a relation of Moses, Aaron and Miriam. He challenged the leadership of Moses and the priesthood of Aaron, believing them to be less worthy than others, including himself and he picked up a following of 250 men, some of them notable chieftains and dignitaries. Among them were Dathan and Abiram, brothers from the tribe of Reuben. Whereas Korach talked about the holiness of the wider community, Dathan and Abiram, not being Levites, were less interested in sacerdotal rites than in material well-being. They argued that Moses hadn’t delivered the promise of the Exodus and that slavery in Egypt was better than this protracted wandering in the wilderness. In our sidra, Moses refers to the Reubenite rebellion of Dathan and Abiram, but does not mention Korach, who was apparently their leader. It is believed that the story in Numbers 16 originates from two separate sources, one about the Levite revolt of Korach and the other about a Reubenite rebellion involving Dathan and Abiram. The source of the Korach story is said to be the ‘Priestly’ author who specializes in priestly and levitical functions, whereas the Dathan and Abiram story is generally attributed to a supposed earlier author, sometimes known as the Elohist, often regarded as being responsible for narratives about the Patriarchs and the tribes. The stories get spliced in Numbers, so that all these persons are part of the same revolt. According to the same theory of biblical authorship, the text we’re reading from Deuteronomy is later than the Elohist, who refers to Dathan and Abiram, but a bit earlier than the priestly author who knows about Korach. Naturally, the author of Deuteronomy has knowledge of the fate of Dathan and Abiram, but he doesn’t mention Korach, because he hasn’t had access to the Korach story. But, if you accept that the words of Moses in Deuteronomy are indeed authored by Moses you may want to look at it another way. The Reubenite opposition may have been less painful to Moses than the rebellion in his own family, from his cousins, Korach and the other Levites. And there are other possibilities. There are one or two negative portrayals of the tribe descended from Reuben, Jacob’s first born, and Reuben himself gets a raw deal because the mantles of kingship and priesthood are inherited by his younger brothers Judah and Levi. He is one of those firstborn sons, like Ishmael and Esau for whom primogeniture has none of the usual advantages. Whichever way you want to look at it, Korach is written out of the passage we read today. 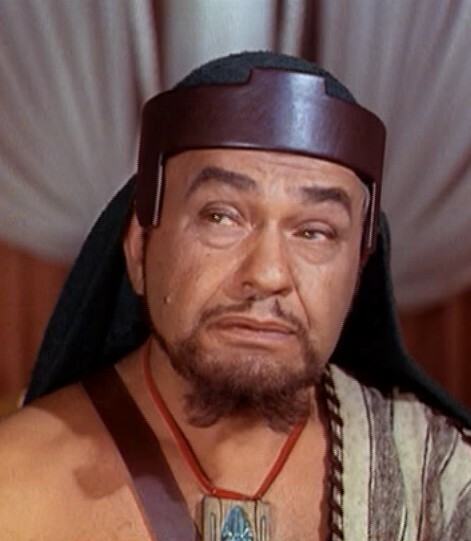 One more word about Dathan; if the name sounds familiar, it may be because he is the amoral, self-serving character portrayed by Edward G Robinson in Cecil B Demille’s film, The Ten Commandments. Biblical epics offer their own midrashim, possibly for the most pragmatic of reasons and MGM puts the blame squarely on Dathan, the Reubenite.